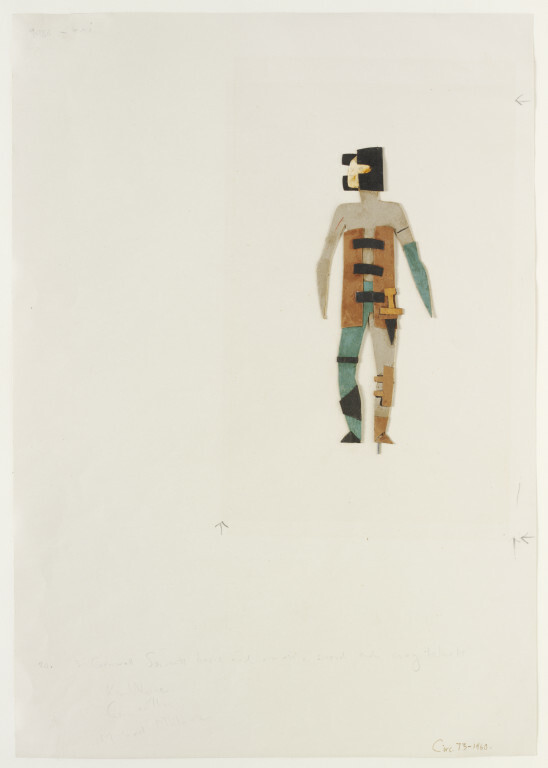 Costume design by Isamu Noguchi for the Duke of Cornwall's servants in Shakespeare's play, King Lear, Shakespeare Memorial Theatre Company, Palace Theatre, London, and European tour, 1955. 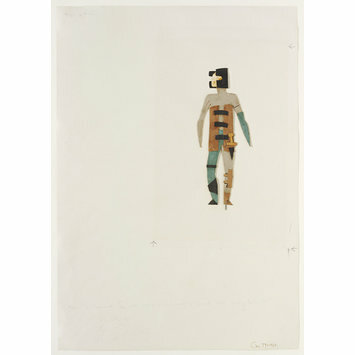 Instead of painting or sketching his costume designs, Noguchi produced little paper figures. Though subsequently mounted on paper with the makers’ notes and instructions added, the figures were designed to stand upright, and the wire strut that supported each one is still attached. The actual information conveyed by this design for Cornwall's servants is not easy for a costume-maker to interpret. The use of paper reduces everything to a flat plane, so there is no indication of weight or thickness of materials. Is the dagger intended to be stuck through the fabric of the body armour, or does it have a separate holder? How rigid can the body armour be and still allow the actor some movement in the body? The costumiers had to warn director George Devine that the costumes demanded stylized fight sequences, but it took a disastrous dress rehearsal to convince him. To right, attached paper figure with metal wire strut, in the form of a male figure in grey all-overs, the man's right leg and hip and left arm in blue green; the right leg is banded in black with a black calf-guard and the left leg with a brown knee guard. From under the arms to top thighs is a cylindrical 'waistcoat' held across the open front with black bands;at the left hip is a dagger. A black helmet with open top encases the sides of the head. 20. Cornwall Servants basic and armour, sword and ?carry helmets / Ken Wynne/ Conville / Michael Malnick"
The design was created by Isamu Noguchi for the Shakespeare Memorial Theatre Company's 1955 touring production of Shakespeare's King Lear. The play was directed by George Devine, with John Gielgud as Lear. The production opened in Brighton on 6 June, then visited festivals in Vienna, Zurich, The Hague, Amsterdam, Rotterdam, Berlin and Copenhagen, before playing at London's Palace Theatre, 21 July to 17 September. It then went to Hanover, Bremen, Hamburg, Oslo, Newcastle-upon-Tyne, Edinburgh, Glasgow, Manchester, Liverpool, and finally came to the Shakespeare Memorial Theatre at Stratford-upon-Avon, 29 November to 17 December. Tthe Duke of Cornwall's servants played by Ken Wynne, David Conville and Michael Malnick. The costumes were made by Carl Bonn and Colin Mackenzie.